How Good is Virat Kohli? Virat Kohli’s masterful chase against Australia a few days ago excited the cricket world beyond boundaries. Everyone is talking about how great Kohli is and how he compares to other batting legends. Headlines have hailed how he is better than Sachin; Sambit Bal tweeted that he is to Pakistan what Miandad used to be to India; and social media forums are in a frenzy over discussions comparing Kohli with Viv Richards, Ponting, ABD, and others. There is no doubt that he is an exceptional talent and a phenomenal batsman. There is no doubt in my mind that his unbeaten 80 odd against Australia was the best T20 knock I have ever witnessed. Kohli has played similar outstanding knocks in ODI cricket as well and he definitely is the king of all chases. No one chases a target like Kohli; no one builds an innings in a chase like Kohli; no one has won matches for India like Kohli has; no one has won matches for anyone like Kohli has. He really is exceptionally good. But how good really? 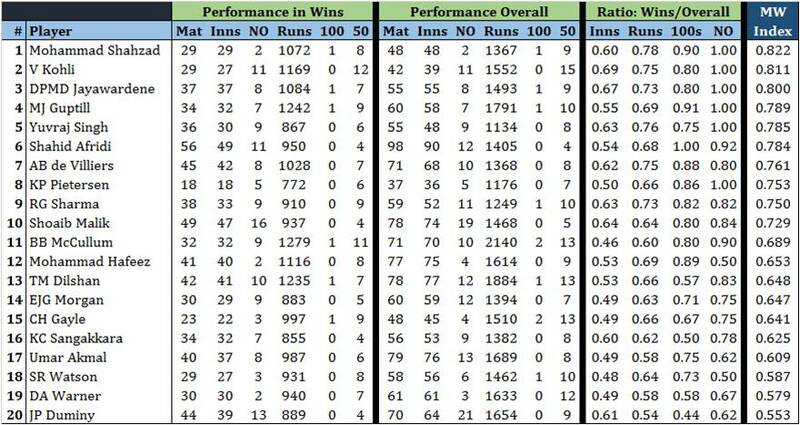 It is not only difficult but probably wrong to compare batsmen of different eras. Limited overs cricket has changed so much in the favor of batsmen that averages and strike rates are inflated in these modern times. Shorter boundaries, bigger bats, field restrictions, bouncer limitations, better pitches, and many other one-sided rules have resulted in a plethora of batsmen averaging above 50 in ODIs, which was unheard of in the 80s and 90s. Plus, batsmen these days don’t face Wasim, Waqar, Garner, Marshall, Lillee, Thomson, Ambrose, Donald and the likes. Currently, there are 7 batsmen who average above 50 in ODIs and only one of them (Bevan) made his debut in the 90s. In T20 cricket, there is only one batsman who averages above 40 – Virat Kohli – he averages 55.42 !!! The next best T20 average is 38.96. In terms of numbers there are other modern day ODI batsmen that are as good as Kohli is; however there are none in T20 cricket. No one even comes close! His T20 average is 16 runs more than the next best. That is a significant difference and shows how well Kohli has mastered the art of batting in the shortest format. 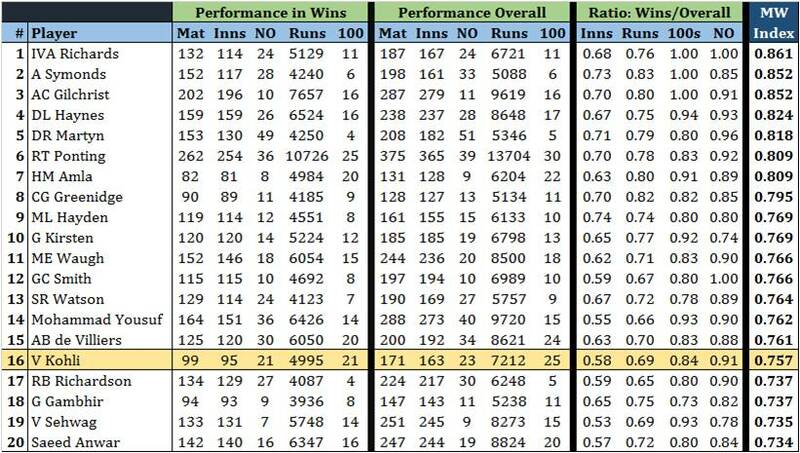 While compare averages and strike rates across eras cannot be compared, I think there is one factor that can be definitely compared – the match winning ability of batsmen. I believe that we can fairly compare a batsman’s contribution to wins irrespective of era, conditions, rules, and opposition. Percentage of not outs in wins. 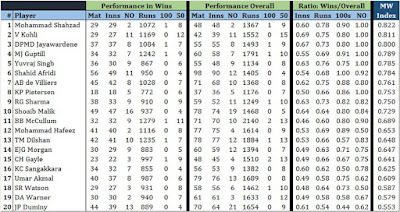 Here are the Top 20 match winning batsmen in ODIs. Sir Viv Richards right at the top! That should put to rest any discussion on whether Kohli is better than the best ever ODI batsman or not. Kohli ranks 16 on this list; however among Indian batsmen he is at the top. 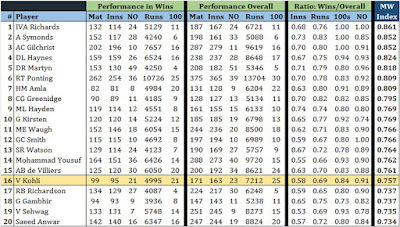 No other Indian batsmen has contributed to wins as much as Kohli has with only Gambhir and Sehwag coming close to him. It is also fair to say that Kohli still has majority of his career ahead of him so we will surely witness this modern day great reach greater heights. While Kohli may not be as good as Viv Richards was, nor as good as many other modern day batsmen as an ODI match winner, he is the best India has produced. For comparison, Sachin (MWI of 0.655) ranks 43rd on this list. It is interesting to note the high number of Australians at the top end of the table. As many as 6 of them played as part of the same team also. No wonder they won so many ODIs and lead the tally of most World Cup wins. For Pakistan, Mohammad Yousuf and Saeed Anwar stand out; but it is also interesting to see that Saleem Malik (0.728), Younis Khan (0.714), Shahid Afridi (0.711), Ijaz Ahmed (0.698), and Inzamam Ul Haq (0.687) were great contributors to ODI wins for Pakistan, and hence the dominance in the 90s. Coming back to Virat Kohli; it is a different story altogether when you compare the MWI for batsmen in T20 Internationals. Barring Afghanistan’s animated Mohammad Shahzad, Virat Kohli is the best in the business when it comes to winning T20 matches for India. He has the best ever T20 average, he is the only batsman to average above 40 in the format, and he has the best ever T20 average in wins. Virat Kohli is a T20 giant and a master of the format. I can understand the euphoria created by that explosive and perfectly executed innings against Australia. We also tend to live in the moment and forget about other greats that have played the game. It is fair to say that Kohli is the best T20 batsman out there and the biggest T20 match winner the world has seen. It is also fair to say that he is the best ODI match winner produced by India; however he is some distance away from being the best in the world. Kohli may well end his career as the best limited overs batsman ever and he may well be counted among the test greats one day as well; but there is some time till that happens. For now, we should just enjoy his mastery and the effortless ease with which he bats. I was viewing recent matches of Virat Kohli in which he made exceptional display of batting prowess and that reminded me of comparative assessment of such extraordinary calibre with one of greatest mentor of this game i.e none other than GOD OF CRICKET (SACHIN TENDULKAR). Virat may be fine in his techniques in scoring comparatively faster than Sachin in his overall innings but that does not take the credibility of LITTLE MASTER who with his master strokes had been the canter stage of attraction for millions of viewers like me who have been enjoying the CRICKET BALL TO BALL only to see the star rising day by day. As at the said times bowling attack appeared to be quite lethal and brutal in shape of ALLAN DONALD (AFRICA) PAKISTAN ( Wasim Akram). WEST INDIES (AMBROSE), BRUCE REID (AUSTRALIA), HADLEY and against said bowlers of extraordinary talents,and against said lethal attacks, batsmen were having limited options.